Everyone seems to rate the soggy race at Monza as one of the best of the year - it has even been described as better than the Belgian GP. I beg to differ. It was a good race with the result that everyone hoped for, but it was hardly the nail-biting, edge-of-your-seat stuff that we enjoyed at Spa. Of course it was wonderful to see a small team and a young driver put one over the big boys - but, before we start talking of the new Schumacher (and who wants to return to those bad old days anyway? ), let's get some perspective on Vettel's win. It was not entirely unexpected, given the STR3's recent performance, especially in the wet. Ever since Fuji last year, it has been clear that Toro Rosso are able to make an Adrian Newey chassis handle better in the wet than Red Bull seem capable of. I do not know what they do to make this happen but the evidence is there every time it rains. What has been different of late is that STR have been catching their sister team in the dry too. Some of that may be down to the drivers, STR having a pairing that is new and eager to prove themselves, but much must be the result of the Ferrari engine gaining so much extra power while the Renault has stood still, by the manufacturer's own admission. So obvious has this become that there are calls for RBR to adopt the Ferrari engine for next year, the assumption being that Renault will continue to abide by the spirit of the engine freeze, in spite of the fact that it is clear that Ferrari have been happily circumventing it. I would not count on that one. So STR's performance at such a wet Monza is more or less what we should have expected and Bourdais' fourth position on the grid merely confirmation that the car to have when the track is streaming is a Toro Rosso. I see that Alonso is now of the opinion that STR are the third best team; let him back that up by going to them next year then! The fact remains that, on a dry track, BMW and probably Renault and Toyota are still quicker than STR and, on a damp circuit, nothing will touch a McLaren. What was remarkable was the cool head shown by Sebastian Vettel when presented with such a chance. He made the best use possible of his advantage, building a substantial lead in the early laps when he was the only one who could see where he was going, then maintaining a good pace to preserve that cushion through the rest of the race. Even Ayrton Senna threw away such chances on occasion. But that does not mean that we have another Senna on our hands. If we look at Bourdais' performance after giving away a lap and a half to the rest of the field, it has to be said that he did as good a job as Vettel with the same equipment. The young German has proved he is as talented as so many of the recent arrivals in F1 - but it will be a while before we can set him alongside some of the great names of the past. All this adds up to a pretty boring race at the front, especially as Kovalainen was unable to do anything about the STR ahead of him. Why that should have been so is more difficult to guess. On qualifying form, one would have expected the McLaren to be able to stay with the STR (ignoring visibility problems) but it soon became obvious that Heikki was not going to catch Vettel, even when the track began to dry out. Hamilton's progress up the order showed that the McLaren could be made to perform well and I must presume that Kovy's explanation of brakes that would not warm up made all the difference. That puts Hamilton's race in an even better light, however, and it is fitting that he should have been the only exciting thing happening in the Italian GP. For the rest of the race, there was very little to write home about. Oh, there was plenty of overtaking but most instances of this were of much quicker cars coming past slower ones. I was not exactly on the edge of my seat when Raikkonen managed to get by Fisichella, for instance. And, while giving credit to the BMW team for getting their boys up the order through efficient and judicious pit stops, it was hardly the stuff of which legends are made. So I must disagree with the majority (yet again) and say that the Italian GP was good but nowhere near the glorious exhibition of F1 at its finest that was Spa a week ago. Even the sudden discovery by the media that STR used to be called Minardi does not impress me. There were things about Minardi that made it everyman's favorite underdog - some of that went when Paul Stoddard bought the team and the remnant died when Mateschitz changed its name to Toro Rosso. If any team inherited the spirit of Minardi, it was the plucky little Super Aguri, and we have had no substitute since the plug was pulled on Honda's odd experiment with a second team. Many of the old Minardi personnel may remain at STR but the ethos has changed; my beloved Minardi team has gone forever and this GP was won by Red Bull money and a designer named Adrian Newey. "Even the sudden discovery by the media that STR used to be called Minardi does not impress me." And thank you, Keith. The few good finishes that Minardi did achieve are worth much more than STR's victory at Monza. They were achieved by spirit alone, without decent funding or major backing, and were just reward for a team that competed because they loved racing. We may never see their like again. Still Clive, I'd give kudos to Minardi. Yep, I'd rather call them Minardi than Toro Rosso. They may have more money now, but the people and the culture are the same. I refuse to think that's changed just because they've got a bigger budget. And even then, that budget (and their personnel count) is nowhere near Red Bull's. So the fact that they're now outperforming Red Bull (who was best of the rest early on this year behind the Big 3) really says something about their guts and determination. And they learned that from their Minardi days, I'm sure. Well, Monza had better racing than Spa, I think. Someone pointed out on Keith's blog that the middle of that Spa race was kinda boring. Only the sudden deluge made it exciting at the end. And the fans have been split 50-50 on who was the deserved winner. The FIA decision only made things worse. Even though they made the right call (for me), the process was not handled properly. P.S. What did you think of hearing that German-Italian anthem combo almost 2 years to the day since Schumi announced his retirement? That's taking Spa as we saw it - the idiotic interference from the stewards afterwards doesn't count as far as I'm concerned - although it does give me plenty to write about in the blog! As for the German/Italian combo at the end, it brought back bad memories, yes. I never liked the guy and would point at how much better the racing has been now that he's gone. Aw Clive, you're a real party pooper. I don't agree with you that the spirit of Minardi was only continued by Super Aguri. I had a soft spot for the team, but mostly because of Takuma Sato's brave performances. Otherwise, that team was just a crass Honda publicity stunt from top to bottom, from day one until the day Honda pulled the plug. If you complain about Toro Rosso having Red Bull backing, what was so great about Super Aguri's Honda backing? STR may have an Adrian Newey chassis, but Super Aguri also had a big-name chassis which was already a proven race winner (unlike Newey's STR03). Super Aguri may have seemed romantic. But really they were just rubbish. STR are true underdogs that ought not to have a chance to win a race. The thing about Toro Rosso is that they still have an uncertain future. The are still underdogs. Remember -- Dietrich Mateschitz didn't really want to buy the team in the first place and only did so because Bernie Ecclestone persuaded him. Now Dietrich Mateschitz definitely wants to sell the team (although whether that is still the case following their win is another matter). All of this is not to mention the fact that Toro Rosso yesterday comprehensively beat its two suppliers, Red Bull and Ferrari. A giant-killing. Also, there is the small matter of Red Bull being an energy drink business. Honda is a car making business. It ought not to be a surprise that a Super Aguri-Honda gets on the F1 grid. A second Red Bull team? That's another matter. Toro Rosso are underdogs. And their glorious win yesterday has the spirit of Minardi coursing through its veins. It's definitely not the same as Minardi, I think everyone loved Minardi really, it was hard not to. It was an enjoyable race, I thought that the ending result was most satisfying though, especially with a mixed up pack. Very impressed with Vettel too, especially the way he drove away from Heikki, made Heikki look a bit silly really. Is it like Darth Vader coming back? Hahaha! To be fair to Schumi, the only reason the racing has gotten better is that he was well and truly better than the rest. With him gone, no one has been able to take over that mantle of dominance because no one's proven to be as good as he was. To me, the spirit of Minardi was the cheerful willingness to compete when they knew they had no chance. And Super Aguri demonstrated that during their first year when they had nothing but an old Arrows chassis to work with. They worked wonders and deserved everything they achieved that year. Once they had the Honda chassis, I think they actually under-performed. Sato gave us one or two things to cheer about but really they did less than their first year had promised. So my comparison of the team with Minardi begins to fall apart at that point, I agree. But at least they showed the same spirit for a while. I am not complaining about Red Bull backing for STR but pointing out that they are a very different team from the original Minardi. They have a chassis designed by the last of the great designers, a Ferrari engine that is the best of the lot at the moment and enough money to go testing whenever the other teams do. Minardi had Ferrari engines at times, too - but theirs were customer spec, well down on power in comparison to the factory team's. They also had some very good chassis in the early days - but they were designed by guys without reputations who worked for peanuts. Minardi achieved everything it did purely from the efforts of its personnel. They were not famous names (although they did take on new drivers who were later to become famous) and they made the best of what little they had. They were the true giant killers. STR is more of second string that turned out to be better than the first string. And most of that is thanks to the engine, I reckon. Yes, they are underdogs but not in the same way that Minardi were. But the truth is I hate all seasons where the best driver has the best car and runs away with all the races as a result. The reliability of the cars in Schumacher's day just exaggerated the dominance that he achieved, partly through ability (although there were others around equal to him who never had the equipment to compete) and partly through being a consummate politician. A good summary of my own thoughts - though I did think it an entertaining race with plenty of passing - at least until it dried out. Not to take away from Vettel's performance, but I think much of the grid would have been delighted to find themselves at the wheel of a Red Bull/Toro Rosso in the wet. i have to admit i shut off all the electronics after the race ended. i missed all the minardi and new schu frenzy so, i may keep doing that through the end of the year just for self preservation. i agree with most of what you say but, i think one of the reasons everyone rated this race higher than it's merit is because we're all sort of tired of red and silver. the colours blend well but, i do love to see the underdogs take the day once in awhile. personally, one of my favourite races was monaco the year panis won ,('96?) because he was at the top of my underrated driver's list at the time. the only thing that made that race edge of the seat viewing was i wasn't sure anyone was going to still be rolling by the end of it. and, i know you lauded vettel's performance but, should that have been a surprise to anyone? i had a feeling at the time that that fill in performance he put on at indy wasn't a fluke. even if he'd been sub'ing in a mclaren that result would have surprised me. and yes, at the time i thought everyone was going overboard on the rampant "next new thing" front. it's what everyone does when they've exhausted the real talk. i'd rank him on a par with kovi but, like any other good, solid driver without the wheels to prove it with we'll never know how good he is. and the wheels that are capable of winning consistently are a bit thin on the ground. I am glad to see another team winning too, Vera - when one team dominates, F1 does get terribly boring. I was a Panis believer too, so I know what you mean. But, if we look objectively at the Monza race, there wasn't a helluva lot of excitement going on, especially at the front. As for Vettel, I have been more critical of him than most. Until recently, there has been very little evidence of the talent that everyone has shouted about for over a year now. He drove a good race yesterday, however, perhaps the most impressive thing being the fact that he did not let it all go to his head. I can remember Mansell leading at Monaco once, early in his career, and then shoving the car into the barriers because of his excitement. And the first time Patrese led a race in a Brabham, he too threw it away through sheer exuberance. I'm not sure I know where to rank Vettel now. The remaining races might be very interesting, now that Bourdais seems to have overcome his problems and is beginning to show how good he is too. I am getting confused as to who the next great thing is supposed to be. The press seem to change their mind every race. Jackie Stewart always says that at any time there are 6 drivers who are better than the rest. Three of who are really special and one is a genius. At the start of last season Alonso and Raikkonen were indesputably the best two drivers on the grid. Since then the press have awarded the next great thing epithet to Hamilton, Rosberg, Kubica, Massa and Vettel. I may even have missed one. At the same time they say that Button or Webber or Davidson or Sutil and others in a McLaren or a Ferrari would be just as good as any of the current top drivers. Either JYS has got it wrong (can that happen?) or the press are prepared to hype anyone who shows a flash of talent. Monza better than Spa? No way. 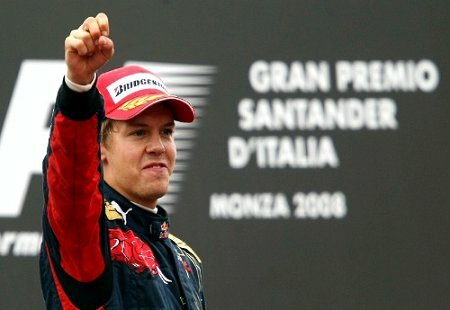 Congratulations to Vettel, I admit that I was very doubtful of the hype around him, but now I confess that I´m very impressed. It is very rare to maximize all things in a special moment and convert this in a win and he did it. It is easy to see how it is difficult when we hear Alonso´s talks with his engineers through the race, he is always trying to read the race conditions and turn this in a win. I have to say I am amazed that the Brazilians are comparing anyone to Senna. I would have thought that Senna would be rated above any driver. I will try to read something from the blogs you linked to. It is good to hear that some people notice his driving and don't want to talk about his father or his press persona. I think a lot of people are going to miss out on appreciating a truly great drver while they are too busy being annoyed that British TV talk about him too much.
" ... this GP was won by Red Bull money and a designer named Adrian Newey." So, if you were to put, I dunno, Huub Rothengatter in the car, he would have won? Becken: Like Steven, I am amazed that the Brazilians should even consider putting someone alongside Senna. To me, he was the greatest ever and I still mourn his passing. But it is true that Hamilton looks like being the closest we've seen in the years since Senna's death and it says a lot for Brazilian fans that they can see beyond mere nationality. In time we will see how right they are. I,ve always thought watching Lewis was just like watching the Late Great Man,the way he was launching the car through the wet chicanes straight into opposite lock and making it look easy is a stlye of driving they recognize and appreciate,a feast for the eyes.I look forward to the day when Lewis and Bruno Senna are racing wheel to wheel,but dread the thought of choosing who to cheer for!. Agreed, Gusto, that Lewis has incredible car control and goes beyond the edge in getting the car through corners in the wet. Will Bruno be as good as his uncle though? I sincerely hope so. I think Vettel's best move as of late is to have told the press he is not "Baby Shumi" or Shumi in any reincarnation. He did a very good job at the Italian GP, but not a great job as the race didn't provide him with any particularly large obstacles to deal with. Where he shone was on the podium and interviews, where he proved to be a much more pleasant and noble human being than Shumacher could ever hope to be. Time will tell what he's made of on the track, but before and after he is a much more palatable person than Shumacher or Hamilton. I don't think it is out of the realm of possibility that Ferrari could use Torro Rosso as tools in their championship bid. To strategically give them a more powerful, or even perhaps illegal engine, under the right circumstances, could serve them well. Spa was real racing. Monza was basically a one horse race.